You can always buy bottled BBQ sauce from various stores or online. But it is useful to know how to make barbecue sauce from scratch on your own. A homemade sauce gives you great joy and adds freshness in your barbecued or grilled meat. Making your own barbecue sauce is easy once you have grasped the art of it. Homemade BBQ sauces are cheaper compared to the bottled barbecue sauces. Experienced pit-masters continuously experiment with ingredients to create their own signature sauce, infusing the flavor of their choices. As a back yard cook, I have always experimented with homemade barbecue sauce and dry rubs to make barbecued meats more delicious. 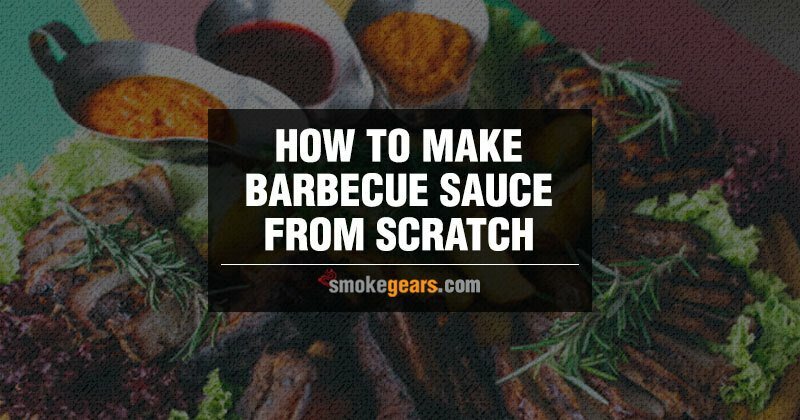 This article will help on how to make barbecue sauce from scratch at home. Thus, before your next cookout, you can make your BBQ sauce and surprise your family and loved ones with fantastic meat dishes. Tastes of barbecued meats depend on the type of m​​eat, style of barbecue, sauce, rub or other seasonings used in the process. Also, the equipment used to grill or smoke the meat along with cooking temperature and cooking time matter to achieve yummy barbecued meats. However, if you like your meat to be juice, and have a sweet flavor, you definitely need to use BBQ sauce. In the U.S., BBQ sauces vary by regions. For example, Southern-style barbecue has its own variety when it comes to appetizers. Vinegar based sauces are used in North Carolina, while Lexington style barbecue includes a mixture of ketchup and vinegar as primary ingredients. In most BBQ parties in South Carolina, traditionally four familiar barbecue sauces are used including mustard based, vinegar based, and light and heavy tomato-based sauces. Memphis style barbecue is well known for tomato and vinegar based sauces. In Alabama, distinctive white sauce made with mayonnaise and vinegar used predominantly on chicken and pork. In Kansas City Style barbecue- the various flavor of barbecue sauce is used including sweet, spicy, and tangy flavors. Making BBQ sauce from scratch at home is a natural step, and the process has several advantages. Besides, creating your own signature style sauce to boost your confidence in grilling and barbecuing, you can have a quality product for your family members. A homemade sauce assures the safety of your family members since it is fresh and doesn’t contain any artificial flavor or preservation. Using fresh tomatoes bought from farmers’ markets you can make a healthy sauce at home to avoid the drawbacks of the bottled sauces. It is not easy to spare some time from our busy lives to make BBQ sauce at home, but if you can manage time to make homemade sauce, you can store it for weeks as well. Making tomato ketchup at home is the most challenging and time-consuming step to make barbecue sauce at home. If you make plenty of tomato ketchup at once, you can use it to make barbecue sauce. You can preserve the ketchup in the freeze for at least three weeks. First, wash the tomatoes with water and then chop them into small pieces. Next, cut the garlic cloves into small pieces as well and dice the onions in beautiful shapes. Now, you have to blend or grind the chopped ingredients together in a blender or grinder for 2 to 3 minutes. Once you have all the ingredients ground, cook the ground ingredients with half a liter of water in a pot. Slowly add the sugar, red chilies, salt, black pepper in the bowl and cook the mixture well. Finally, cook for 1 or 2 more minutes, before you turn off the stove. Then you should let it cool down and transfer to sterilized bottles to preserve or to be served later on. Now that your ketchup is ready, you can make BBQ sauce with it and serve it with dishes you prepare for the guests or dinner/lunch. Now that you know how to make tomato ketchup at home, you can use some ketchup to make the sauce with it quickly. This is one of the easiest and basic BBQ sauce recipe I adore and frequently use at home or any barbecue party. Mix all the ingredients in a bowl and whisk it well. If you want to add more flavor or heat to the sauce, you can use hot sauce, cayenne, garlic powder, and other ingredients. I like to keep my barbecue sauce recipe yummy and straightforward. The homemade barbecue sauce is a healthier alternative to the processed sauce. If you use the homemade sauce to grill meat, you will avoid a high amount of chemical additives and preservatives in your everyday life. Additionally, nothing tastes as good as a homemade sauce made from scratch.